In all the hustle and bustle of the season, it’s easy to forget—or run out of time—to find Christmas gifts for your students. Take a look at 9 simple ideas! Use glitter glue, paint, or permanent marker to write each student’s name or first initial. For extra creative elements, add polka dots, stripes, or stars and ribbon at the top. Start with ornaments, just like with the idea above. Add the year on the back. But instead of making these just for fun, decorate each one with a different name of Christ. If you can, use a name of Christ that starts with the first letter of the student’s name (e.g., give a student named Cameron an ornament with the name Counselor). Your students will have a keepsake from you and a reminder of the reason for the season every time they see their special ornament. Start by filling a piping bag (from the cake-decorating aisle) with one serving of hot chocolate mix. Add mini chocolate chips and mini marshmallows to the top. Use a glue gun to attach googly eyes and a red pom-pom for the nose. Twist a brown pipe cleaner around the top, then bend it on both sides make antlers. 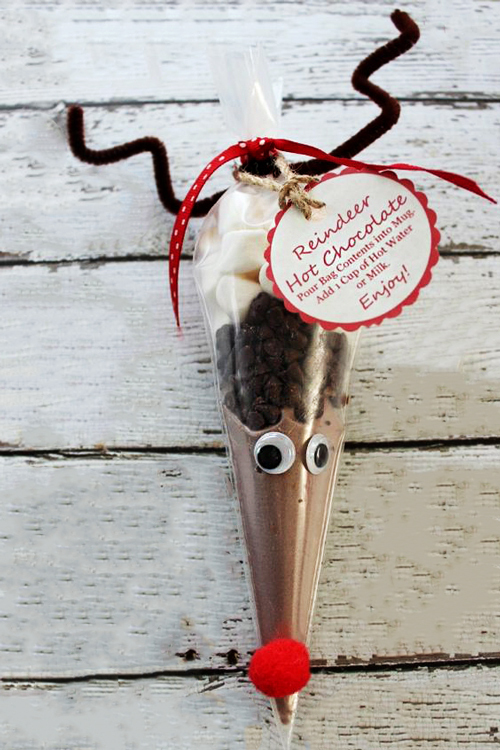 Write instructions for making the hot chocolate, hole-punch them, and tie them on with ribbon. You’ll need Scrabble or alphabet tiles, card stock, double-sided tape, glue, and string. For each ornament, make sure you have enough letters to spell Merry Christmas (subtract one r for the letter that overlaps). Start by cutting two strips of card stock to put the words Merry and Christmas on. Put double-sided tape on one side of each card stock strip. Then, use the letters to spell Christmas vertically. On the other piece of card stock, put the letters m and e horizontally. Overlap the two pieces at the first r. Then, add the last r and y. Glue a loop of string on the back, and it’s ready for their Christmas tree! Wrap a pack of Extra gum with a little ribbon and a tag that says “Wishing You an Extra Special Christmas.” If you wish, add the reference John 10:10b. It’s simple and sweet. 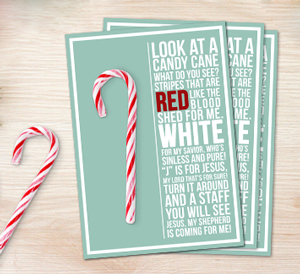 Just print this candy cane poem and tape on a candy cane. 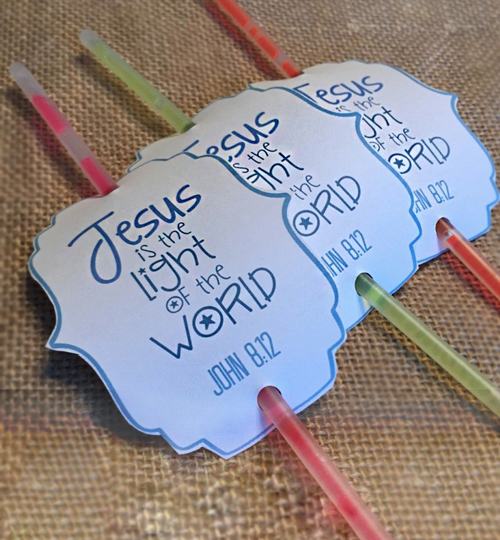 Celebrate the birth of Jesus by giving glow sticks with a label that says, “Jesus is the light of the world,” based on John 8:12. Punch one hole at the bottom and one at the top, then slide the glow stick through. 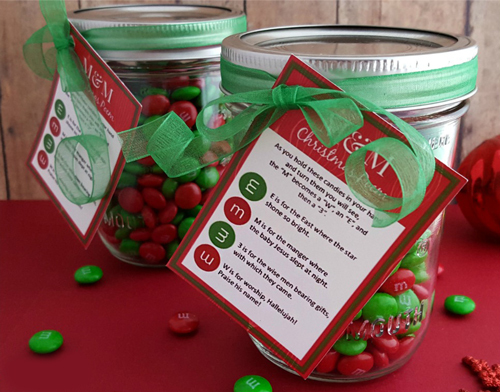 All you need is a little jar or plastic bag and some Christmas M&Ms. Print out this poem and attach it to your jar or bag with tape or ribbon.